Our purpose and goals for our Parent Nights are to share, celebrate and reflect upon students’ learning. We appreciate your partnership in supporting each and every child at South Middle School! If you wish for a more private, extended conversation or were unable to meet with a particular teacher, we recommend you request that a teacher contact you for a phone or in person conference outside of this evening. Sign-up opens Monday, February 4th! The time you sign up for is the time you will visit your child’s COLOR TEAM POD and CORE TEACHERS. See the examples below. In pink, is the time each parent signed up for Parent Night. 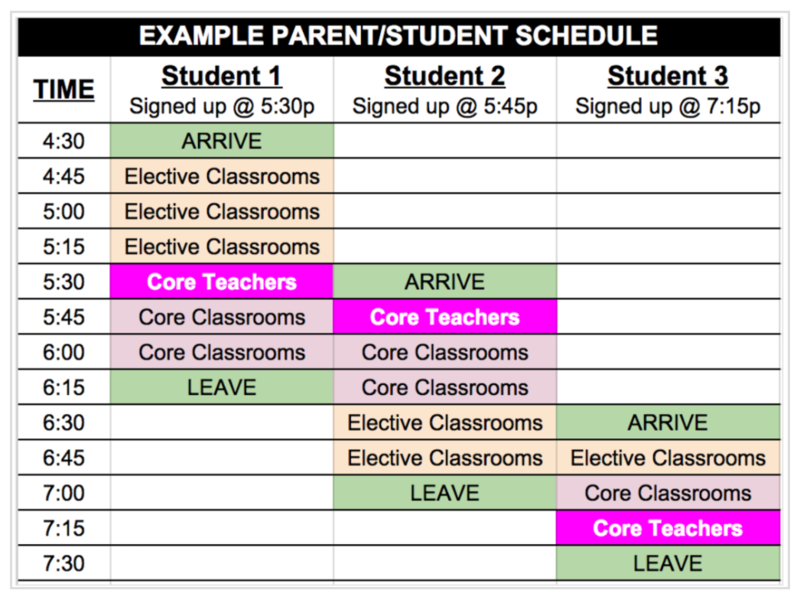 As you can see, parents can visit elective teachers before or after your assigned time. !!! DIRECTIONS AND PASSWORD ARE BELOW – PLEASE READ CAREFULLY !!! To give greater flexibility in scheduling, South Middle School continues to make scheduling available via the web. Starting Monday, February 5, you will have the opportunity to access our calendar and pick an available time that best fits your schedule. If you do not have access to internet access at home or work, the school welcomes you to use one of our computers. Also, you can use a computer at the community library or our district office located at 560 Southeast University Avenue. The following simple instructions are necessary to help you select an available time and create an appointment. Enter the school password (smswarriors). If you do not know your child’s ID#, click the LOOKUP STUDENT ID button to access the system. You will see your child’s Advisory teacher you will sign-up for Parent Night and start the night with. If you have more than one student at SMS, you can schedule all appointments at one time by answering YES to this question, “Do you want to schedule conferences for another student?” If you have only one student, answer NO to that question. You will then see the available time slots. Once you have finished, you can confirm your appointment details and print your time/confirmation. focus on learning, not behavior. focus on the learning process, not simply product. encourage students to reflect on their current proficiency. support students in determining their “next steps” for improvement. students will share artifacts to demonstrate progress toward learning targets. take time to familiarize yourself with the process for this Parent Night. The goal of your time is to celebrate and for your child to share growth and progress toward current learning targets. Upon entering the building, Student Ambassadors will greet you and remind you and your child to start in his/her color pod. meet with any of the core teachers you would like to talk with for 1-2 minutes as a check in. visit each core classroom as your child will be sharing one or more experiences with you and explaining where he/she is with their learning. All elective teachers will be in their regular classrooms unless your child lets you know otherwise. All core (math, science, social studies, language arts) will be available in the pod. We value your involvement and look forward to spending this time with you and your child!